Our project on the future of healthcare is organized into two phases. In the first project we develop a measure of “automatability”. This measure is created through ethnographic fieldwork: close observation of all occupations in Primary Care to gather data using interviews, fieldnotes, document collection, and photographs. We then use this detailed data to create a description of each occupation in primary care, the tasks they perform, and features and characteristics of those tasks. Our final report on this research is released in early 2019. We continue to publish important findings for Primary Care and the NHS, catalogued under research. Once detailed high quality empirical data are collected at primary care field sites we use this data to create a detailed dataset of every occupation in primary care, the tasks they perform, and features of each task. Task features are further augmented using Occupation Net’s (O*NET) database and the detailed work activities descriptions of skills, knowledge, and abilities. This drives the project toward its second goal. Developing a robust quantitative framework using an Independent Bayesian Classifier Combination (IBCC) and Gaussian Processes to generate a machine learning model of automation scores per task. This scale of automation informs our future work on what tasks can possibly be automated and to what extent with current technologies. With respect to automation in the NHS, the main concern is not about the loss of jobs due to automation, as might be the case in other industries. The main concern is about shortage of skilled workers and inability to meet future demands, so computerisation and automation are seen by policy makers as opportunities rather than threats. That should not be taken to imply that there isn’t considerable resistance to automation amongst segments of the workforce in the context of a somewhat inflexible system – there undoubtedly is, but it does mean that clarifying the areas where automation could increase productivity and the challenges that must be overcome will be useful. At the moment, our understanding of the level and impact of automation within the GP ecosystem is mostly anecdotal. 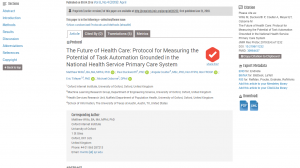 While some health sector automation will undoubtedly involve routine tasks like scheduling and certain lab tasks, automation in the case of healthcare is also likely to involve technologies that are unlike in other sectors and as yet in their infancy: humanoid robots that support interpersonal interaction, algorithms that translate routine but complex tasks into workflows by means of machine learning, or reorganizing GPs’ administrative and diagnostic-support systems to include elements of artificial intelligence (AI). These questions, while looking at specific tasks and the probability of automation, are not narrowly limited to technical concerns but contribute to our understanding of broad and important social issues. As such, we are influenced by, and well aligned with, recent work from Susskind and Susskind that looks at the broad relevance of professions in the 21st century as well as thinking about the role of robots in society from scholars such as Lucy Suchman. Furthermore, it is important to note the extent to which algorithms can stand in for human judgement and inadvertently produce gaps in thinking (e.g. reliance on blackboxed tools can cause people using the tools to stop questioning what is happening inside the box) creating an over reliance on automation. Our work, which will contribute to opening the blackbox of automation, will help counter this natural human tendency. We present findings in standard academic forums including conferences, workshops, invited talks, and in peer reviewed articles. We are also authoring a peer reviewed technical report available to the public, to be released in Q1 2019.